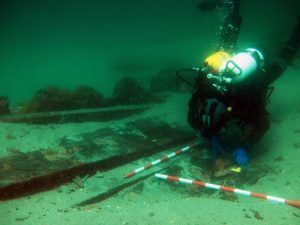 This week’s blog is by Beñat Eguiluz Miranda, a PhD student in maritime archaeology and history at UWTSD Lampeter, and the Marie Curie Fellow with the ForSEAdiscovery Project. 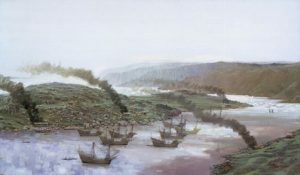 Reconstruction of Newfoundland, Red Bay in Labrador, Canada, in the 16th century Basque whaling season. Every time somebody asks me ‘what is your research on?’, I don’t know what to answer. It is like gathering your scattered thoughts into some kind of coherence. My name is Beñat Eguiluz Miranda and I was born in the Basque Country, in Spain. For some reason, one day I came across a book in which there was a diver raising Roman amphoras, and thought… ‘I like that, I want to do that.’ That is how I ended up being passionate about maritime archaeology. Initially I developed my expertise in history and a bit of underwater archaeology. As I was from the Basque Country, there had always being a legend about the Basque sailors, a myth that was still alive about the adventures and journeys to a far land on the edges of the world: Newfoundland, or as we say in Basque… Ternua. A Portuguese Galleon in the battle of Azores, in 1583. Initially the journeys and adventures that these people were exposed to, made me look closer at these vessels that I ended up being fascinated by: Nao, Galleon, Carrack, Urca, Pinace, Patache, Zabra, Caravel, Txalupa, Fragata. All of these names were given to the ships that sailed the Atlantic, and many more that I am missing or have been forgotten. In the current research that I am undertaking, there were some particular questions that motivated my interests, questions that I could not answer regarding identity. What was Basque shipbuilding like? What was a Basque ship? Or what was a Basque feature in a ship? 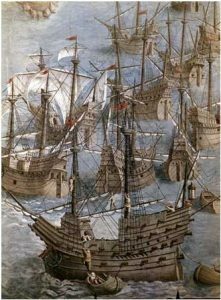 What was Spanish shipbuilding like? Were they any different? Were they similar in any way? Diver observing the planking of the Galleon of Ribadeo, believed to have been sunk in 1597. This initial interest led me to read through previous academic work showing evidences of strong transnational connections between Basque people living in Spain and France. The main hypothesis was that if those connections existed economically, then, in terms of shipbuilding, there might had been a similar construction of vessels onboth sides of the border! However, it turns out that while it initially was thought to be a ‘Basque’ case study, as a particular notion or concept of a coherent and permanent identity, it ended up fading away as a close concept and started to inspire the idea that through the archaeological material, there is a wider identity beyond what we call ‘local’ or ‘national’ identities in terms of shipbuilding culture. Additionally, every one of these ships was unique and when compared to others there was no actual similar pattern, but a range of features, with a great variability and diversity. In other words, that there was no special feature representative of the whole shipbuilding tradition. Those words referring to permanent notions or concepts such as galleons or naos, did not actually show what the real nature of these ships was like. Whether an element in a ship was Basque, English, Portuguese, Ragusan (Croatian), Dutch, Mediterranean or Atlantic started to be rather confusing, as the divisive framework that was established by these ‘concepts’ or notions of static or permanent ‘identities’ merged with one another and had no clear division once looking at the material sources. Left to right: The Nao San Juan, build in 1563 and sunk in 1565 (used for whaling). A late 16th century Spanish Galleon. An early 17th century Spanish Galleon. Therefore, the thesis that initially was just going to study a ‘Basque’ process, ended up studying the process of a culture with a lot of differences and similarities that was interconnected and influenced in such a strong way, that calling something English, Basque or Portuguese, was a rather reductionist and limiting view regarding the apparent interconnectedness of these vessels. A variety of features, with no apparent strict coherence, but rather a variety of diverse alternatives in the production of these vessels was more and more evident. As has been noted by archaeologists such as Thomas Oertling, a shipbuilding tradition is difficult to pin down when there are no clearly distinctive features which differentiate ships. Some called it Basque, others Portuguese, some Spanish, others call it Iberian, some Atlantic, others Mediterranean, some have called it Ragusan, EuroAtlantic, IberoAtlantic, Atlantic-Mediterranean… however this shipbuilding culture is not conditioned or limited by any concept or any name and form, it is always changing and as it has no beginning, no end and it is heterogeneous, with one rule or pattern, which is no particular one. What is it then we are talking about? Can we name it? Wow I can’t even describe how amazed I am.. Thank you so much for sharing!